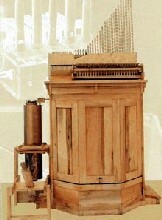 The hydraulis is the first keyboard musical instrument in history and the ancestor of the church organ. It consisted of one or more sets of metal pipes of different sizes, which were supplied with air at constant pressure by a hydraulic mechanical device and activated, so as to produce sound, by special keys. According to the ancient accounts of Athenaeus, of Philon of Byzantium and, indirectly, of Vitruvius, the Hydraulis was invented by the famous engineer Ctesibius. This took place in Alexandria in the third century BC. After its invention, the Hydraulis spreads quickly in the Hellenistic and Roman world. In Rome, it was played in theatres, festivals and even in the amphitheaters, and became the favorite instrument of the ruling class and of emperors such as Nero. 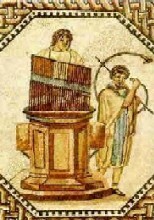 Ancient references to the hydraulis and the many depictions of it reveal that the instrument was constructed in numerous types which varied in size, sound and number of pipes. In August 1992, during excavations at the site of ancient Dion (at the foot of Mt Olympus) the archaeologist Professor Dimitris Pantermalis of the University of Thessaloniki and his associates discovered the upper parts of an instrument consisting of a set of bronze pipes and a horizontal metal base-plate with decorative motifs. Professor Pantermalis dates the find to the first century BC. In early 1995, the European Cultural Center of Delphi (ECCD) initiated a research project for reconstruction of the Dion hydraulis. In 757, Byzantine Emperor Constantius sent an organ and other costly gifts as peace offerings to Pepin the Short, King of the Franks. His act had remarkable consequences. In order that the gift might be copied, a Venetian monk was requested to teach organ building methods to students. From that time onward, the organ spread throughout Europe. 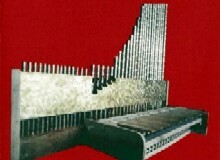 The organ began making its way into churches around 900 CE. Exactly how and why remains an enigma, but it appears that the organ was first used for ceremonial purposes. By the 1400s, the use of organs was well established in monastic churches and cathedrals throughout Europe. Large and small organs were in use on festival occasions and in alternation with church choirs for liturgical purposes. While most Americans may link the organ to the church, the instrument was around for more than 1100 years before it made its way into a church setting. Books and publications for musicians and collectors.